Beloved heroine Maisie Dobbs, “one of the great fictional heroines” (Parade), investigates the mysterious murder of an American war correspondent in London during the Blitz in a page-turning tale of love and war, terror and survival.When Catherine Saxon, an American correspondent reporting on the war in Europe, is found murdered in her London digs, news of her death is concealed by British authorities. Serving as a linchpin between Scotland Yard and the Secret Service, Robert MacFarlane pays a visit to Maisie Dobbs, seeking her help. He is accompanied by an agent from the US Department of Justice—Mark Scott, the American who helped Maisie get out of Hitler’s Munich in 1938. MacFarlane asks Maisie to work with Scott to uncover the truth about Saxon’s death.As the Germans unleash the full terror of their blitzkrieg upon the British Isles, raining death and destruction from the skies, Maisie must balance the demands of solving this dangerous case with her need to protect Anna, the young evacuee she has grown to love and wants to adopt. Entangled in an investigation linked to the power of wartime propaganda and American political intrigue being played out in Britain, Maisie will face losing her dearest friend—and the possibility that she might be falling in love again. Born in Kent, England in 1955, author, Jacqueline Winspear was educated at the University of London's Institute of Education. Afterward, she worked in marketing communications before immigrating to the United States in 1990. From the time she was a very young child, Winspear had an unusual awareness of the struggle her grandfather experienced in World War I. She decided to base her writing career on this subject. Winspear published articles in the Washington Post, Huffington Post, The Daily Beast, and other publications. Her short stories have appeared in magazines internationally, and she has recorded her essays for radio in San Francisco. Her most famous work is the Maisie Dobbs series of books. They are about a woman who came of age during a time when women took on the jobs of men, and many remained unmarried because many men had gone to war and did not return home. 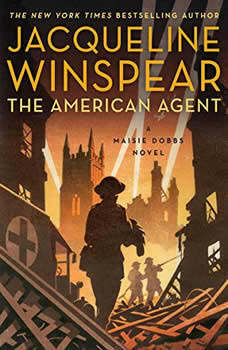 Since it had been said that an entire generation had lost its innocence due to the Great War, Winspear took advantage of that unique time to create mysteries as a vehicle for exploring facets of that time. To Die But Once, is her latest in the Maisie Dobbs series released in 2018. She has 14 other novels in the series. Her novels have garnered her several prestigious awards, and have placed her on several bestselling lists.